Erik Robinson is competing with Keao Monteilh and Desmond Thomas for a starting safety spot at UH. Hawaii football coaches hope safety Erik Robinson is ready to make a sudden impact this fall -- particularly on opposing receivers and backs. "E-Rob" is a 5-foot-11, 198-pound junior college transfer from Texas. He is among several candidates to fill the position vacated by Leonard Peters, who is now with the New York Jets. Robinson's a hard hitter, who has been timed at less than 4.5 seconds in the 40. "He could be a huge, huge key for us," said defensive line coach Jeff Reinebold, who recruited the Dallas product after Robinson managed 115 tackles at Navarro Junior College in Corsicana, Texas, last year. Robinson is already in Hawaii, working hard to learn defensive coordinator Greg McMackin's schemes from teammates in informal workouts at the Manoa campus. 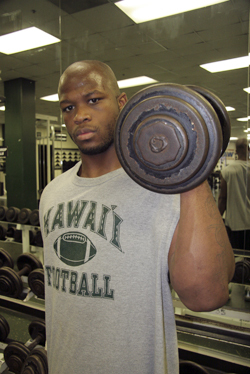 Erik Robinson says he isn't quite sure how he ended up in Hawaii. But he knows why he's here -- opportunity. "Coach Jeff (Reinebold) just found me," the incoming UH safety said after a workout last week. "Oak Cliff (Dallas), Navarro Junior College (Corsicana, Texas). I was being highly recruited at first, then I hurt my ACL in 2005 and a lot of schools didn't want to take a chance with me. Then Coach Jeff showed up and told me they had a scholarship for me." That was after the 5-foot-11, 198-pound Robinson made 115 tackles at Navarro, the most in the nation for any JC defensive back last year. It made him seem like a good candidate as a replacement for safety Leonard Peters, who is now with the New York Jets. Robinson arrived in Hawaii on May 15, and has spent the time learning UH's defensive schemes, often with returning starting safety Jake Patek as mentor. "We go in coach's office and go over stuff on the board," said Patek, who played in the same junior college conference as Robinson, as well as returning UH cornerbacks Gerard Lewis and Myron Newberry. "He seems to be picking it up and coming out on the field he's showing he's learned it. He seems to be working pretty hard. That's a good trait, hard worker." So is hard hitter, especially for a safety. The report on Robinson is that he lays the wood. He's also been timed at under 4.5 seconds in the 40. "He was the best defensive player on our team," Navarro coach Ray Woodard said. "Because he could cover so much ground and he was so good at coming up to the line from deep, I was able to do a lot of different things with our defense. Also a great character guy. We're really going to miss him." UH coach June Jones expects a lot from Robinson. "He's the real deal," Jones said at his letter-of-intent day news conference. "We had a need there with Leonard leaving and we think he will be an impact player for us this season. Being from junior college he's a little bit older and more mature. His size and speed is a little different than what we've been used to." Robinson grew up in South Oak Cliff, one of the toughest neighborhoods in the Dallas area. "I ran with a hard-head crew. I stayed in trouble," Robinson said. "I didn't start playing (football) until my junior year of high school. I knew if I stayed in the streets I was going to end up in jail or dead or something. I took the positive road and stuck with (football). And it got me here, and I'm working to make a success of myself." Like many newcomers before him, Robinson said the Warriors' togetherness is among his favorite things about his new team. "I enjoy the players. Everybody's like family. Coming from Navarro, we didn't have that kind of bond. I didn't really hang out with the players, I had just a few guys I'd hang out with. But everybody here is like family," Robinson said. "When I was in high school and at my JC, we had good players but we didn't win a lot of games. I was like, 'I'll sacrifice, but I want to win.' I knew Hawaii was winning, and I knew there's an opening for a safety." Robinson also knows the starting spot next to Patek won't be handed to him. Returnees Keao Monteilh and Desmond Thomas will be among the contenders. But no one emerged as a clear favorite in spring practice. "(The starting spot is) there," Patek said. "If you want it, it's there. It's all a matter of how hard you work. That's how it was when I came here. There were guys in front of me, but Coach said, it's there, go get it."